In the lead up to the IPCC 5th Assessment Report next week, let’s review the Unburnable Carbon report and remind ourselves how much carbon we have left to burn. WHAT: Measuring the amount of capital, assets and infrastructure that is currently overvalued and will be stranded or wasted when we act on climate change. As I’m sure all of you RtS readers are aware (and excited about! ); the IPCC are releasing the first part of their 5th Assessment Report on Friday September 27th and then slowly drip feeding us chapter by chapter over the next year. This is exciting for climate nerds like me because the last IPCC report came out in 2007, so it was looking at the state of climate science in a very different world – before the 2008 financial crash, before the weather started getting seriously weird and going haywire, before 98% of Greenland melted one summer, the Arctic Death Spiral, the failure of the 2009 Copenhagen talks…. yeah, a lot has happened since 2007. So, in preparation for when this international ‘State of the Climate’ report comes out, I thought it would be good to look at the Carbon Tracker’s Unburnbable Carbon report from this year to remind ourselves of the budget of carbon we have left that we can spew into the atmosphere and still have a chance of not totally cooking the climate. The Carbon Tracker report looks at two different budgets – if we want to have an 80% chance of not going beyond a certain amount of global warming, and if we want to have a 50% chance of not going beyond a certain amount of global warming. Given that we haven’t done much to lower global carbon emissions yet, I think we’ll push to a 50/50 chance of cooking our habitat (humans are great at procrastinating after all), but feel free to be optimistic and look at the 80% option. 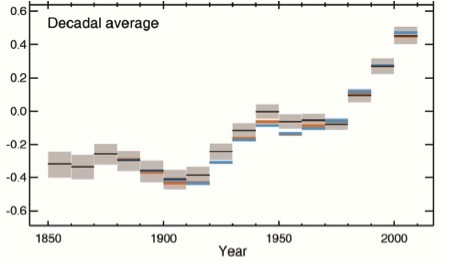 If we start from the assumption that humanity will act to save ourselves and keep global warming at 2oC or less with a 50/50 chance, we have 1,075 Gigatonnes (Gt) of CO2 left to burn over the next 37 years. Now, you might ask – what about carbon capture and storage? Everyone says that technology is going to be big! The Carbon Tracker people ran those numbers. The 2015 estimate for carbon capture and storage projects (CCS) is 2.25million tonnes of CO2 being sequestered over 16 projects. The idealised scenario for CCS is that it will be able to sequester around 8Gt of CO2 each year, which Carbon Tracker worked out would be 3,800 projects operating by 2050 and would only reduce the above carbon budgets by 125Gt. It definitely isn’t a ‘get out of jail free and burn the fossil fuels’ card. Speaking of burning all the fossil fuels – how much do we have left? The World Energy Outlook, which gets released by the International Energy Agency each year estimated in 2012 (the 2013 report will be released in November this year) that there were total assets equivalent to 2,860Gt CO2 in the world. This is enough carbon to cook the atmosphere beyond 3oC and probably into the next mass extinction. 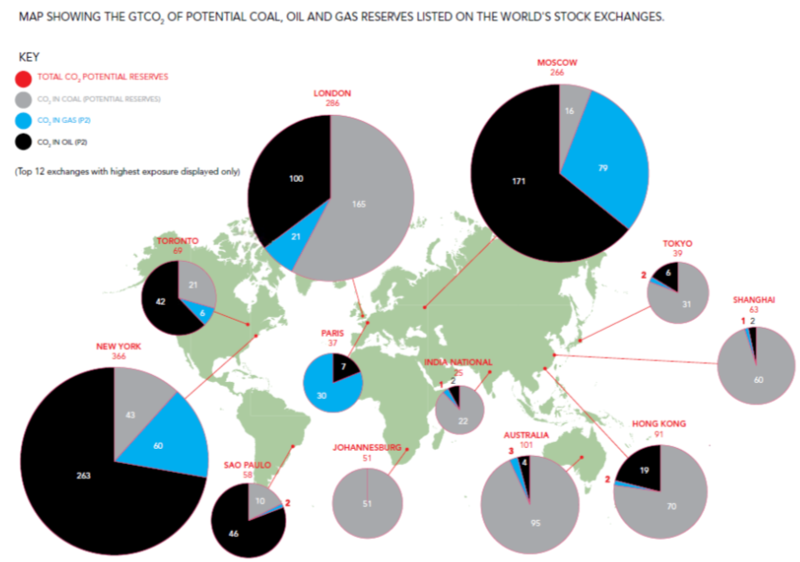 The report rightly points out that if we assume we want to save a livable climate and keep within the above carbon budgets, then between 65-80% of all the listed reserves for fossil fuel companies cannot be burned. It’s simple math: 2,860 is more than double the budget for keeping under 2oC with a 50/50 chance of blowing past the temperature. But enough about trying not to cook the atmosphere – how about the important things – like what does it mean for financial markets? Carbon Tracker looked at the capital expenditure by publicly listed fossil fuel companies to work out how much money is being spent trying to find new reserves of fossil fuels that will add to the list we can’t burn and are therefore being over-valued, because the market valuation assumes they will be burned and a profit will be made from burning it. In 2012, the 200 listed fossil fuel companies spent $674billion on capital expenditure. $593billion of that was spent looking for more oil and gas, while $81billion of that was spent looking for more coal. If these kinds of spending continue (if the companies don’t admit that there is going to be an end to carbon pollution) over the next decade $6.74trillion dollars could be wasted looking for fossil fuels that have to stay in the ground. As the authors say: ‘this has profound implications for asset owners with significant holdings in fossil fuel stocks’ because what investors are being sold is the lie that these reserves can be profitably sold and burned. There’s also a lot of risk associated with this. Over the last two years, the amount of carbon being traded on the New York Stock Exchange has increased by 37% and in London it’s increased by 7%. This means that similar to the sub-prime loan crisis that precipitated the 2008 financial crash, all investors are exposed to carbon risk through the over-valuation of fossil fuel companies. There’s a risk of carbon not being properly managed as a risk within stock portfolios which could create a carbon bubble that will burst as carbon starts being constrained, and there’s also the risk of stranded assets, where the fossil fuel companies sink all the capital expenditure into their projects only to find they can’t burn the carbon and there was no point in building the mine/gas well/oil platform in the first place. The report states: ‘investors need to challenge the continued pursuit of potentially unprofitable projects before costs are sunk’. This makes sense also because oil and gas are becoming harder to get at (tarsands, tight oil, gas fracking, Arctic drilling), so the cost is going up and the profit margins are getting squeezed, unless the price of oil keeps climbing. This means that fossil fuels are going to increasingly become challenged by lower cost lower carbon options, because mining for sunshine is really not that hard. So if we agree that we’ll stop burning carbon before we’ve cooked the atmosphere and therefore that means that 80% of the world’s fossil fuel reserves need to stay in the ground, what does it mean for the fossil fuel companies themselves? Well, they may have some debt problems on the horizon. The report points out that even without a global climate change agreement the coal industry in the USA is looking increasingly shaky, just from new air quality regulations. They point out that if the business models unravel that quickly, these companies may have problems refinancing their debt when they mature in the near future (which is also a risk for investors). They point out that any company with tar sands exposure will also have stranded asset risk because the business model relies on high oil prices to be profitable. Basically they show that traditional business models are no longer viable in energy markets that will be moving towards decarbonisation and that different information is going to be needed for investors to manage the risk of carbon in their portfolio. 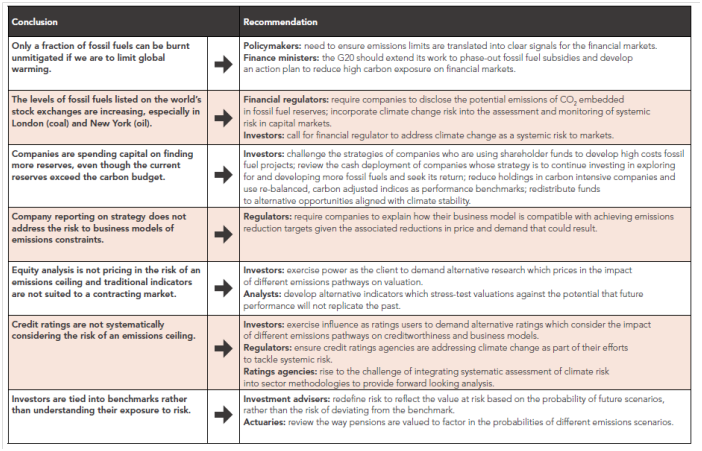 In the final section of the report, Carbon Tracker gives a list of recommendations for investors, policy makers, finance ministers, financial regulators, analysts and ratings agencies for how we can avoid this financial carbon bubble. The recommendations include better regulation, shareholder engagement and resolutions, fossil fuel divestment, and better risk definition. For what it’s worth, my recommendations would be to remove fossil fuel subsidies, stop looking for new reserves of carbon that we can’t burn and price carbon pollution. 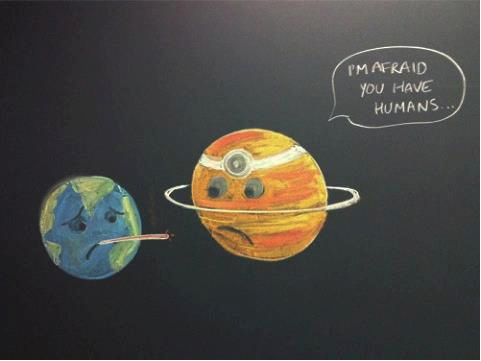 And as usual, stop burning carbon. So far the ‘targets and timetables’ approach to keeping climate change below 2oC has done very little to reduce emissions. What happens when we start thinking about giving up the 2oC target? 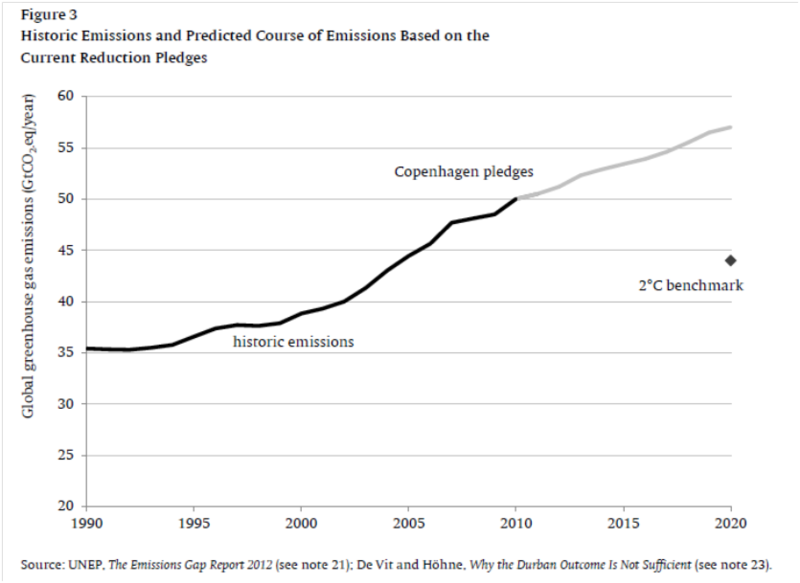 WHAT: Looking at the ‘politically possible’ in light of our failures to get anywhere near the emissions reductions needed to keep global warming below 2oC. This paper is all about the realpolitik. At the outset, it points out that in the 20 years since the UN framework on climate change (UNFCCC) was adopted that progress has been ‘modest at best’. Also, in order to keep global emissions from soaring quickly beyond the 2oC limit, significant reductions will be needed in the decade between 2010-2020, which is ‘patently unrealistic’. Ok, so we’ve procrastinated away the most important decades that we had to do something about climate change with minimal impacts on both the economy and the wider environment. What now? This paper suggests that the best bet might be changing or ‘modifying’ the internationally agreed on 2oC target. The author points out (quite rightly) that unrealistic targets signal that you can disregard them with few consequences. For instance, I’m not about to say that I’m going to compete in the next Olympic Marathon, because the second I miss a single training session it’s obviously time to give up given I’ve never run a full marathon before. So if the world is going to fail on our 2oC training schedule, what will we aim for instead? 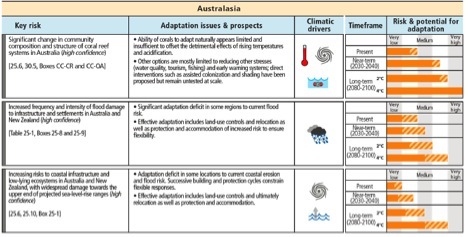 Should we just aim for redefining ‘safe’ and ‘catastrophic’ climate change? Should we aim for 2.5oC? Should we aim for short term overshoot in the hopes that future humans will pick up the slack when we’ve kicked the can down the road for them? The author points out what many people don’t like to notice when their countries are failing on their carbon reduction diets – not only have we already warmed by 0.8oC, but we’ve already baked in another 0.5oC from current emissions, so we’re already really close to 2oC without even starting to give up our fossil fuel habits. Also, those reductions we’ve all been promising to make and failing to make (or withdrawing from completely in Canada’s case)? Yeah, if we met all those targets, we’d still blow ‘significantly’ past 2oC. Ouch. Another issue – the current top-down UNFCCC approach assumes that once we reach an agreement, that effective governance structures can be set up and operating within a matter of years, which is highly unlikely given we can’t even reach an agreement yet. So what does a ‘more pragmatic stance’ for the EU on climate policy look like if we’re going to collectively blow past 2oC? Will climate policy have any legitimacy? The author argues that the coming palpable impacts of climate change will soon remove the political possibility of ignoring climate change as an issue while in office (which I for one am looking forward to). He also doesn’t place much faith in the UN process finding a global solution with enough time – if an agreement is reached in 2015, it’s unlikely to be ratified by 2020, at which point the targets from 2015 are obsolete. One suggestion for the EU is reviewing the numbers for the likelihood of passing 2oC. 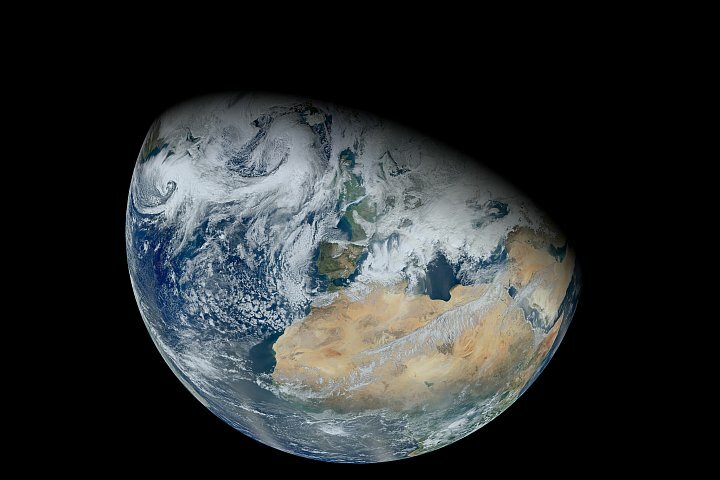 Currently, humanity is vaguely aiming to have a 50/50 chance of staying below 2oC. If we could roll the dice with slightly higher odds of blowing 2oC, maybe we could buy some time to get our political butts in gear? That idea puts all the hard work of mitigation on everyone post-2050, at which point we’ll all be dealing with the climate impacts as well as trying to find the time for mitigation. 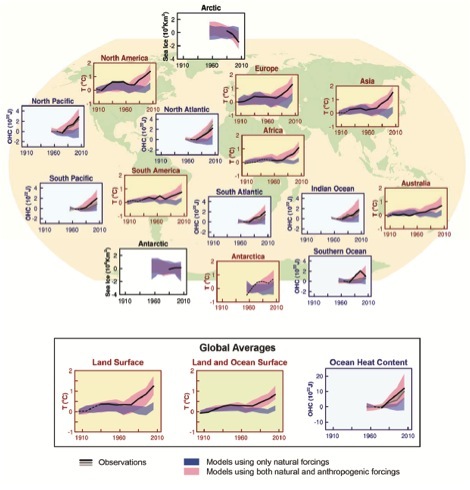 The other option is to say that 2oC is a ‘benchmark’ (only slightly better than an ‘aspirational target?’) and put our faith in climate inertia allowing humanity to overshoot on emissions and then increase the amount of sequestration (negative emissions) to pull back from the brink of the next mass extinction. 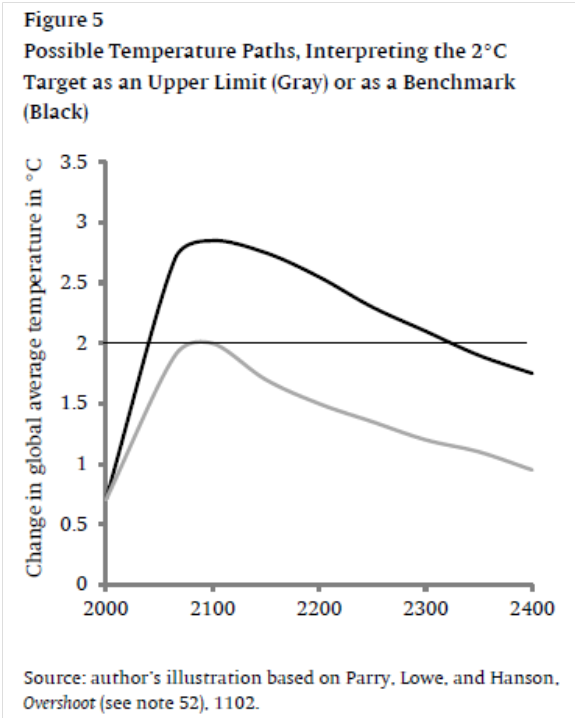 The paper does acknowledge that this will implicitly approve a temperature overshoot as well as an emissions overshoot, which could possibly kick the can down the road to 2300 before global temperatures are below 2oC above what we used to call ‘normal’. Apologies to everyone’s great great great great grandchildren for making you responsible for all of that. The author also acknowledges that overshoot policies will only be accepted by the wider public if they’re convinced that this time governments will actually respect them as limits not to be passed. Previous experience with the UNFCCC processes show that any extra time that can be wrangled through carbon accounting is likely to be procrastinated away as well. 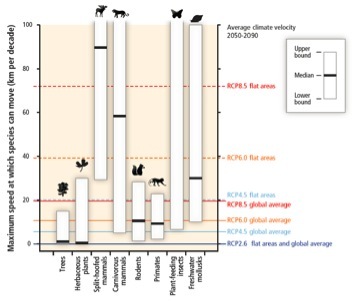 The other option could be a target of 2.5oC or 550ppm of CO2 in the atmosphere, but as the paper points out, the ‘targets and timetables’ policies haven’t worked yet, and it might be time to look more towards feasible ‘policies and measures’. The problem for me with this paper is that while it’s practical to look at aiming for what humanity can politically achieve in terms of climate policies, redefining what ‘dangerous climate change’ is to fit with realpolitik rather than physics won’t work. Physics doesn’t negotiate – the first law of thermodynamics doesn’t care that there was an economic downturn in 2008 that has made it harder to pass climate legislation. So yes, we need to think about what is politically possible in the current ‘we can still procrastinate on this’ climate. But we also need to be planning for the tipping point once all the extreme weather adds up to business as usual no longer being feasible. We may be able to ‘postpone the impending failure of the 2oC target’, but we won’t be able to ignore the impacts of climate change.